In Pittsburgh, Pennsylvania, five are shot dead by an expert sniper. All evidence seems to point to James Barr, a former army sharpshooter, but he sticks by his story that he is innocent and writes a note which says: “Get Jack Reacher”. Reacher, a drifter and former army military police officer, sees the news report and turns up in the city. The defense is immensely relieved, but Reacher says he has come to bury the guy. Shocked at the accused’s request, Reacher sets out to confirm for himself the absolute certainty of the man’s guilt, but soon comes up with more than he bargained for……. You can certainly understand the fuss. In Lee Child’s Jack Reacher books, Reacher is 6 foot 5. Tom Cruise, who for some reason was chosen to play him in on screen, is nowhere near that. Of course Child has now publically said that he was mistaken and that Cruise carries off the role so well that his lack of height is not an issue. A very similar thing happened many years before with Anne Rice and the Cruise-starring Interview With The Vampire. Far be it for me to be cynical and suggest that politics and even money played a part in this, but I reckon that if I was a fan of the books I would certainly have a hard time accepting a short actor in the role. More to the point though, is the first film in what is an attempt at a new franchise for Cruise [isn’t one enough?] any good? Well, it’s perfectly okay but with not much to distinguish it. I wasn’t bored, and don’t regret seeing it, but I won’t rush out to buy it. Nor will it encourage me to read any of the Reacher books, which seem to be usually described as “good page-turners” but nothing more. The attempt here is obviously to make an action movie that is closer to one you might get in the 70’s, with the action more spread out and low-key, while conversations play out at a decent length rather than giving the impression that they’ve been cut to the bone to make room for some more explosions. A worthy thing to do then, but one that does not entirely come off. One major reason is Reacher himself. As written for the screen, he’s a pretty uninteresting hero, a slightly confused variation of characters like Dirty Harry, who sometimes go beyond the law to do what they think is the right thing, and Cruise doesn’t help by playing him like Ethan Hunt with less morality. 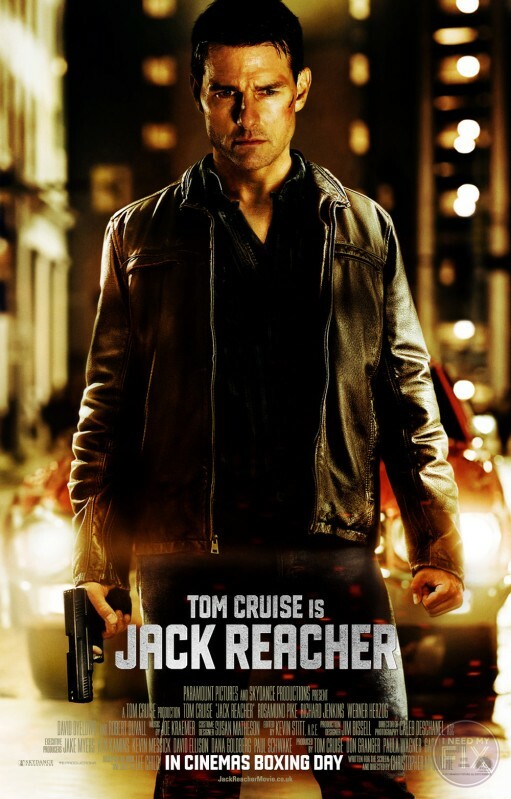 I can imagine Clint Eastwood doing a good job with him if this had been made back in the 70’s,; there are even some mildly amusing lines for Reacher to deliver which Eastwood would have said wonderfully, but instead we get Autopilot Tom, the Tom that is frankly a little dull. Saying that though, he does convincingly give the impression that he is very tough and can beat up five guys who are half his age, something which he had always been good at. I just don’t feel he gives films like this his all. Of course there’s nothing wrong with him just having fun, but he doesn’t look like he’s having much fun and doesn’t at all seem relaxed. Instead he seems wound up like a coiled spring, but never letting loose. The opening scene, obviously intended to evoke Dirty Harry, is rather scary as we assume the point of view of the sniper as he looks through his telescope at various targets and all we here is his breathing. Reacher’s introduction, leaving a clearly satisfied woman in a hotel room as we only see him from the back, is nicely done. The early investigative scenes are relatively interesting, as we are allowed to see the opening shooting from various angles and in fact writer/director Christopher McQuarrie, who to be honest hasn’t really done anything notable since his great screenplay for The Usual Suspects, does very well with several later scenes in which he shows us visually what characters are telling us instead of just showing them talk. The leisurely pace to much of the film, especially the first half, would not be a problem if the story and main character were interesting, but I got less and less interested in the plot as the film went on, with one ‘twist’ being something I’d guessed right from near the beginning, and I’m normally not very good at this kind of thing. Frankly, if this film follows the book closely, then the books aren’t that good. Every now and again Reacher has to best a few heavies, and McQuarrie certainly does well with these scenes. He lets us see the action properly and shows considerable brutality with eye gouging, finger breaking and head stamping amongst the delights on offer, without actually being graphic. I would still say it’s a little vicious for a 12A rating, though apparently two brief bits have been shortened at the behest of the censors, one being very obvious. I loved the way Reacher is willing to fight as dirty as possible if he feels it is necessary, and my only complaint about the fighting is that the final one is a little short. There is also a terrific car chase which manages to be very exciting while still just about keeping things believable. That is one thing that I did find interesting about Jack Reacher; it tries to keep things realistic, and it mostly succeeds in that area. Despite its very impressive direction and sometimes good staging though, it never entirely gels, though you could certainly do far worse at the cinema at the moment. Now I am always happy to see the lovely Rosamund Pike on screen, especially when we are given ample looks at her cleavage, but she and Cruise have hardly any chemistry together and are a pretty mediocre team. You’ve probably heard that the great German director Werner Herzog plays the main bad guy, a good idea as his face and voice are perfect for screen villainy and he’s always struck me as a little scary. He’s given a great introduction, coming partially out of the darkness behind somebody, after which we cut to someone else and just hear the great man’s voice. He’s not in the film very much though, and actually his acting is not too good. Elsewhere the villains are mostly laughably incompetent, Robert Duvall’s character makes little sense, and actually if you think about it the overall plot doesn’t make much sense either. The film could have easily lost 20 minutes too; it isn’t boring, but it is a tad repetitive in some sections and some of the information given could have been shown more crisply. Joe Kraemer delivers a score that often tries hard to create suspense when there is little. Jack Reacher seems to be a slight disappointment at the box office at the time of writing so it isn’t sure yet whether sequels will happen. There are 16 other Jack Reacher novels. On the evidence of this film, I’ll certainly not object to watching films of the others though won’t really be excited at the prospect. In any case, there are plenty of other literary heroes which even Cruise could have a decent stab at. 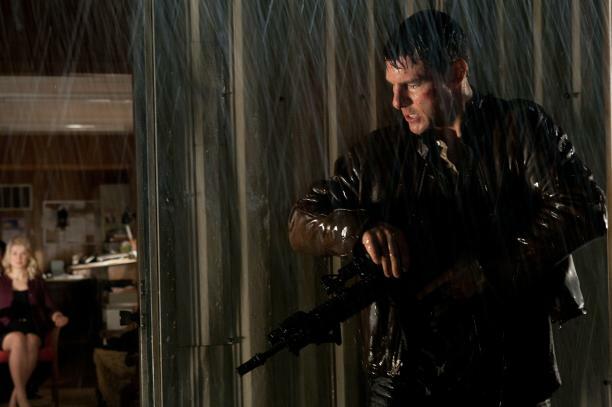 Though it is well made, there are points of interest and a few very well done scenes, overall Jack Reacher is a bit bland and not original enough to stand out in the crowded world of this kind of movie today. As I said, I didn’t feel my time was wasted watching it, but ask me in a couple of weeks things about the film and I doubt I’ll remember much of it. Extended Trailer Released of ROCK OF AGES show Tom Cruise SINGING!